Also Available In Audiobook Format! 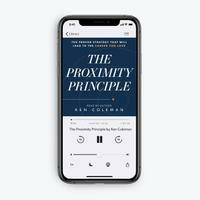 Preorder The Proximity Principle Audiobook today and get $20 in bonus items. Calling all job hunters, career changers and college grads! Feel like the career you want is just too far out of reach? You’ve got the tools—you just need the manual that will get you closer. Even if it’s not too late, what if I try and fail? What will my family and friends think if I try something new? Is my dream career even possible for me? The mind-set and skill set Ken acquired early in his career—and shares daily with his radio listeners—is now a proven strategy that can work for you too. Ken Coleman will guide you toward the people and places you need to be closer to in order to succeed in getting a job you love. The Proximity Principle demystifies the questions about who you need to know and where you need to be in order to find new opportunities. Break free from boring and land your dream job with The Proximity Principle. Note: This hardcover book is a preorder item that will ship on May 13, 2019. Preorder today in order to get $20 in bonus items. See more details about what’s included with your preorder below! Preview & read the first chapter of The Proximity Principle! When opportunity comes knocking, will you open the door? 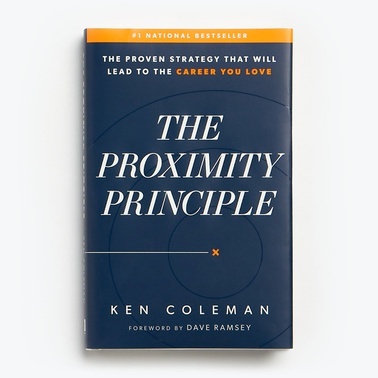 Ken Coleman’s The Proximity Principle will help you to recognize and maximize the big breaks in your life. This is my favorite kind of book. Simple. Compelling. Practical. Every person who wishes they could do what they love has to read this. In this guide to finding your sweet spot personally and professionally, Ken brilliantly unpacks the importance of doing life with the right people, being in the right places, and living with the right practices. If you only read one book this year to help you grow, read this one. Hardcover book will ship on May 13, 2019. FREE BONUS ITEM - Delivered by email on May 13, 2019. FREE BONUS ITEM - Delivered instantly in your order confirmation email. Ken Coleman is host of The Ken Coleman Show and the top-rated EntreLeadership Podcast, and author of One Question: Life-Changing Answers from Today’s Leading Voices. An acclaimed interviewer and broadcaster, Coleman equips, encourages and entertains listeners through thought-provoking interviews, helping them grow their businesses, pursue their passions, and move toward a fulfilled purpose. Coleman joined Ramsey Solutions in 2014 and frequently guest hosts The Dave Ramsey Show—the third-ranked nationally syndicated talk radio show in America. Chapter 1: What Is The Proximity Principle?